In today's world of the internet and public healthcare, it is surprising how little we know and understand about our hearing. 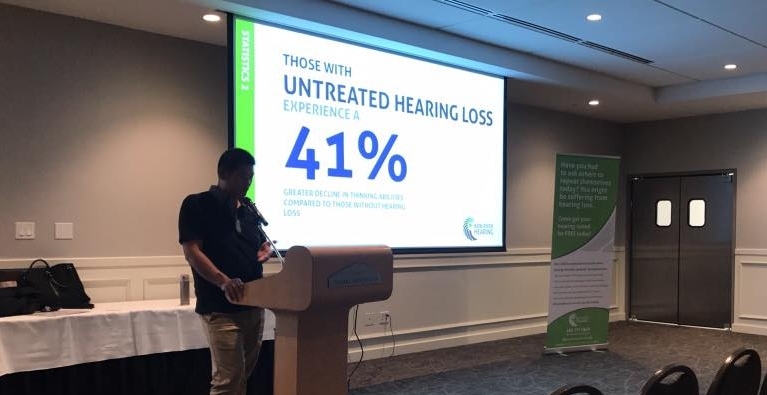 The Know Your Hearing campaign was developed to bring education to the public. Our presentations and seminars have ranged from Tinnitus and Dementia; to our Workshop on Hearing Aid Basics, to learning how your hearing works by creating a string telephone. Our goal is to deliver exciting and engaging information on hearing, so people of all ages will know how to better protect, maintain and enjoy their hearing. If you would you like us to speak at your next club meeting, school class or event, please contact us. People with untreated hearing loss are 41% more likely to develop dementia. 25 decibels in hearing loss (volume of your watch ticking) can be the equivalent of 7 years of cognitive ageing. Hearing is often lost in the high frequencies first, making it hard to hear parts of words like the "f" and "th" sounds.